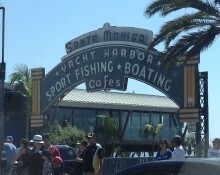 The City of Santa Monica is home to many families, celebrities, beach lovers, Hollywood elite and die hard surfers. It’s one of the most visited areas in all of Southern California thanks to attractions like the famed Santa Monica Pier, the California Heritage Museum and the Third Street Promenade. If someone you know, a friend or loved one perhaps, has been arrested and taken into custody in the city of Santa Monica, you’re probably interested in getting them out of jail as soon as possible – and we can help! A bail bondsman is available 24 hours a day to take your call. Our years of experience in the bail bond industry is at your immediate disposal. We can be reached locally at 310-782-BAIL (2245) or toll-free at 855-414-BAIL (2245). No matter how many questions you have, we’ve got your answers. The city is patrolled by the Santa Monica Police department who work with the citizens of the city to provide an effective law enforcement service. When someone is arrested in or around the City of Santa Monica, they will be taken to the station to undergo booking and processing. If they are not eligible for one of the other options for release, then they will likely be held temporarily at the jail located on the premises. If a bail bond is not obtained while the inmate is still located at the Santa Monica police station jail, then they will likely be transferred to one of the larger facilities in downtown Los Angeles. Men are typically transferred to Twin Towers Correctional Facility while women are taken to the Lynwood Jail. These larger facilities are incredibly busy, and if this transfer occurs, it is likely that the individual will spend additional time in police custody as they are booked into the new facility. Bail bonds are only one of several options for release that are available when someone is arrested. Depending on the nature and number of the crime(s) that the individual is charged with, he or she maybe eligible for one of the other options for release listed below. Own Recognizance – This is when an inmate is granted their release provided that he or she provide a written agreement that they will meet all of their court obligations. Cited Out – The police will sometimes cite someone out if they have been charged with a minor crime, like a traffic violation, or an infraction. One someone is cited out, they make a promise to appear before the court at the appointed date and time, and are otherwise allowed to go about their business. Cash Bonds – When bail is set, it isn’t always necessary to call a bail bondsman in order to get someone out of jail. It’s possible to bring in the full amount of bail to the court clerk, pay it, and secure the individual’s release. This is often the most expensive option. Property Bonds – These are exactly what they sound like. Instead of putting up cash or obtaining a bail bond to secure someone’s release, it is possible to put up a piece of property or real estate instead. Perhaps you’re wondering, since a bail bond isn’t the only way to get someone out of jail, why bother with a bail bondsman at all? The answer to that is two-fold, cost and experience. Depending on the crime, bail can be very expensive. In order to get someone out of jail without a bail bondsman, you will need to bring in the entire amount of bail and pay it to the court clerk, or sign over a piece of property that equals the bail amount in its entirety; which can be as little as a few thousand dollars or as much as tens-of-thousands of dollars. Most people don’t have that kind of cash just lying around. Apart from the cost, our fully licensed, trusted bail bondsmen have years of experience in the industry and are capable of navigating the system a lot quicker than someone who doesn’t typically have to deal with it. When you call us, we can quickly locate your friend or loved one within the system and verify their eligibility for bail. After that, you need to fill out a few simple bail bond application forms and indemnitor agreement. That’s it. We do all the work when it comes to contacting the jail and securing the inmate’s release. As a matter of fact, we can do the whole bail bond application process via fax or email, meaning that you don’t ever even have to leave your home or office. If you would like additional information regarding Santa Monica bail bonds, please feel free to call us any time of day or night. A bail bondsman is available around the clock to answer your call and get you the help you need. We can be reached at 310-782-BAIL (2245) or toll-free at 855-414-BAIL (2245).